Still want to relax but have a few problem areas you would like focused on? You are offered the options of Full Body, Upper Body, or Legs and Back. Majority of massage is focused to the tissue structures. This is the most popular modality at SKP Massage! New Modality at SKP Massage!! Looking to increase your flexibility, or just needing a good stretch? This is it!! Depending on the length of time, the therapist will focus on stretching major muscles of the body from head to toe!! A form of massage designed for highly active people who engage in athletics. Such activity in sports is harsh on the body and can often lead to injuries in both the short and long term. Sports Massage enhances performance and prolongs a sports career by helping to prevent injury, reducing pains and swelling in the body, relaxing the mind, increase flexibility, and dramatically improved recovery rates. Sports Massage is also highly effective in aiding the rapid recovery of an athlete from an injury by encouraging greater kinesthetic awareness and in turn promoting the body’s natural immune functions. *The Gill Special Focuses on the legs and back only. on different positions of the body. KT tape application can also be done with a half hour of Therapy for $45. Deep Tissue Massage is a form of bodywork that aims to relieve tension in the deeper layers of tissue in the body. Deep Tissue Massage is a highly effective method for releasing chronic stress areas due to misalignment, repetitive motions, and past lingering injuries. Due to the nature of the deep tissue work, open communication during the session is crucial to make sure you do not become too uncomfortable. Please note that post session soreness is pretty common after the treatment, and it is recommended to drink plenty of water before and after your session. This massage is for the purpose of relaxing you, to put you into a state of tranquility. Do not worry about falling asleep on the table; this just means the therapist has done their job of getting you into such a state. Fun Fact; one hour of relaxation massage is equivalent to two hours of sleep!! Hot Stone Therapy is a style of massage where heated stones are placed at specific sites on your body to deepen relaxation and promote circulation in your muscles. Muscles that are heated with these stones release tension and stress much more deeper and quicker than with a traditional massage. The overall experience is very relaxing, nurturing, and rejuvenating. A form of massage, prescribed as a medical necessity by a physician, to which a specific amount of units (15 min) of massage or manual therapy are applied to Head/Neck, Upper & Lower Extremity, or Back. A very relaxing and therapeutic style of bodywork. It combines oils or lotions with an array of strokes such as rolling, kneading, and percussion, and joint movements to help the body improve its circulation The benefits of this type of bodywork are wide-ranging and include relief from aches and pains, decreased stress levels in the body, enhanced mental clarity, and greater flexibility. *Can be medically necessary, some clients may require a medical release. For those times when a massage on the table just is not going to happen. With the chair our therapist can reach a broader range of clients who are on the go. From festivals, to visiting offices for those employee appreciation days, or in our office for those clients that just need a few minutes to help release the daily stress on their neck shoulders and back. $1 a minute up to 30min. Relaxation massage adjusted to a patient’s needs, throughout the course of treatment and following up into remission. As a way of enhancing a session for a desired effect, consider having your therapist add Essential Oil. Talk to your therapist about the endless possibilities! !As a way of enhancing a session for a desired effect, consider having your therapist add Essential Oil. Talk to your therapist about the endless possibilities!! Utilizing suction cups to imitate a form my myofascial release, cupping is well received by tissues where pressure is just too much. Negative pressure (suction) is gently applied to restricted areas to allow for more freely moving tissues. Cold Marble stones are placed upon the face to relieve pain from sinuses,headaches and Migraine. Applied to one aspect of the body, utilization of moist heat and the Topical Prossage, allow for dilation of the tissues, to ease the sensation of achiness. Biofreeze is then applied to prolong the relief. Ideal for hot/cold therapy needs. We use an all-natural sugar-based mixture (Abundance Soaps) and moist heat to exfoliate your feet, and finish with massaging foot balm into the tissue. This 10 week package alternates a 60min Sports Massage session, and 30min Body Stretch session, for 8 weeks. Week 9 is a Hour Pre-event Sports massage, with week 10 concluding a 90min Post-event Sports Massage. All sessions must be pre-booked to guarantee availability. Boasting natural, certified organic botanicals, Biotone Relaxing Therapeutic Massage Creme will boost the effectiveness of treatments. 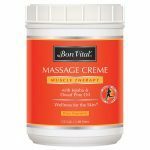 This massage cream will add smooth gliding and moisturized, non-greasy finishes to your massages, further enhancing each experience. Its organic botanical ingredients include lavender, passion flower, Melissa, chamomile and sage to help diminish tension, reduce stress and promote total relaxation. The pure essential oil of lavender gives this product a pleasant, light scent that will enhance the calming of body and mind. This cruelty-free product is also free of parabens. Ingredients: Water infused with Certified Botanical Extracts of Passion Flower (Passiflora incarnate), Lavender (Lavendula officinalis), Melissa (Melissa officinalis), Chamomile (Chamaemelum nobile), and Sage (Salvia officinalis), Coconut Oil Ester (Octyl Palmitate) Soy Oil, Emulsifying Wax (Vegetable Derived), Cetyl Alcohol (non-drying emollient), Jojoba Oil (Simmons chinenis), Grapeseed Oil (Vitis vinifera), Vegetable Glycerin, Dimethicone, Polysorbate (vegetable derived), Carbomer, Iodopropynyl butylcarbamate, Phenoxethol, TEA. Paraben-free, cruelty-free. Provides pain relief for hard-to-reach areas, such as middle back, neck and lower extremities. Proprietary formula made with USP-grade ingredients. Free of parabens and propylene glycol. Enriched with Dwarf Pine, Jojoba, Squalane and Olive oils, and a blend of Rosemary, Peppermint, Eucalyptus, Melissa and Chamomile essential oils, to give clients superb muscle soothing benefits. Ideal for therapeutic & sports massage, swedish, deep tissue, neuromuscular and trigger point therapies. Austrian Dwarf Pine Oil adds a light warming sensation, while the blend of oils provides a gentle glide with just the right amount of friction. No Nut Oils. Paraben Free! Ingredients: Purified Water, Octyl Palmitate, Olive Oil (Olea Europaea), Cetearyl Alcohol, Polysorbate 60, Glycerin, Jojoba Seed Oil (Simmondsia Chinensis), Sesame Seed Oil (Sesamum Indicum), Grapeseed Oil (Vitis Vinifera), Diazolidinyl Urea (and) Iodopropynyl Butylcarbamate, Squalane, Triethanolamine, Carbomer, Pro Vitamin B5 (Panthenol), Vitamin A (Retinyl Palmitate), Vitamin E (Tocopherol Acetate), Gluconolactone (and) Sodium Benzoate, Arnica Extract (Arnica Cordifolia), Dwarf Pine Oil (Pinus Pumilioni), Eucalyptus Oil (Eucalyptus Globulus), Peppermint Oil (Mentha Piperita), Rosemary Oil (Rosmarinus Officinalis), Melissa Oil (Melissa Officinalis), Chamomile Extract (Matricaria Recutita). Creates a smooth, non-slip controllable glide. Great use for pain management, sports injuries, orthopedic and deep tissue massage. SKP Massage uses essential oils from all three companies Message us with specific questions about what oils we have in stock to be used. If you have a specific oil blend you want used, or a topical you prefer, we have no problem using your product during your massage. Edens Garden takes great pride in providing 100% pure therapeutic grade essential oils. Essential oils from plants connect us to the botanical world and are renowned for their therapeutic and beneficial qualities. they are steam distilled/cold pressed directly from flowers, leaves, bark and wood without and adulteration or synthetic additives, as it was intended, directly from nature.